Although, I thought the above merely indicates the class is not designed to be subclassed but it can the situation sparked my interest to create my own UIActionSheet template that I could reuse with the same animation types as Apple’s. I’ll describe step-by-step what I did to build the prototype and I have provided the sample project which is posted on GitHub that you can use as a reference to follow along step-by-step. 1. I first created an iPhone Single View Application and in my Main.storyboard dragged a label to know this was my Main View. I then embedded the ViewController in a NavigationController so that I could have a Navigation bar. 2. In the MainViewController implementation I added a leftBarButton to viewDidLoad in order to popup a UIActionSheet and have something to compare to. I also made the MainViewController follow the UIActionSheetDelegate protocol. UIActionSheet *popup = [[UIActionSheet alloc] initWithTitle:@"UIActionSheet"
This should give you an App that has a left bar button in the Navigation which popsup a standard UIActionSheet. 4. 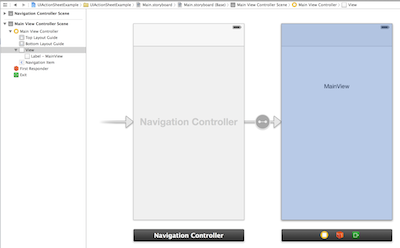 Then I created a new UIViewController subclass with XIB which I named DDAUIActionSheetViewController and put into its own Navigator Group in Xcode. 8. 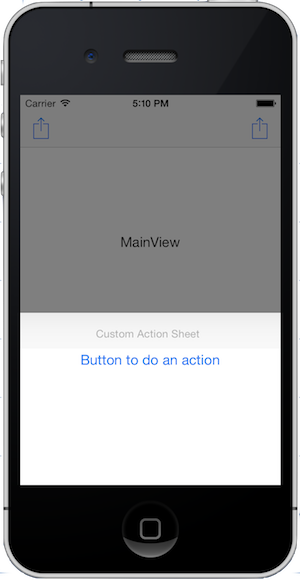 In the viewWillAppear of the DDAUIActionSheetViewController implementation add a call to a slideIn method which will slide in the custom UIActionSheet. Then the slideIn method I added sets an initial location and animates a transition for the view in the ViewController. That’s it. Now you have an App that pops up the standard Apple UIActionSheet on the left bar button item and a right bar button item that pops up a custom UIActionSheet that you can expand on. If you like what you’ve read and want to know more I suggest the WWDC 2012 Session Video by Matt Gamble & Bruce Nilo entitled Session 236: The Evolution of View Controllers and the Bruce Nilo follow-up WWDC 2013 Session Video entitled Session 218: Custom Transitions using View Controllers. The first session discusses how best to take advantage of view controllers by examining what problems they were invented to address, how they’ve matured over the past releases, and how to be best prepared for where they’re going next. The second session discusses how to take advantage of custom transitions by using powerful new animation APIs, explores changes with full screen layouts, and sees how to use navigation controllers with collection views to create truly immersive experiences. This entry was posted in Uncategorized and tagged UIActionSheet. Bookmark the permalink.